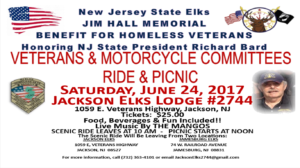 JACKSON – The New Jersey State Elks Veterans Committee will be holding Motorcycle Ride and BBQ Picnic to benefit New Jersey’s homeless veterans on June 24 at the Jackson Elks Lodge, 1059 East Veterans Highway. Registration for the scenic ride starts at 9 a.m., the ride kicks off at 10 a.m. and the BBQ Picnic runs from 12 to 5 p.m.
Tickets cost $25 and include food, beverages and live entertainment by the Mangos. All proceeds will benefit New Jersey’s homeless veterans. In the first three years holding this event, the Elks were able to raise $7,000 for homeless veterans. Last year, the Elks blew those numbers out of the water and were able to raise an incredible $18,000. 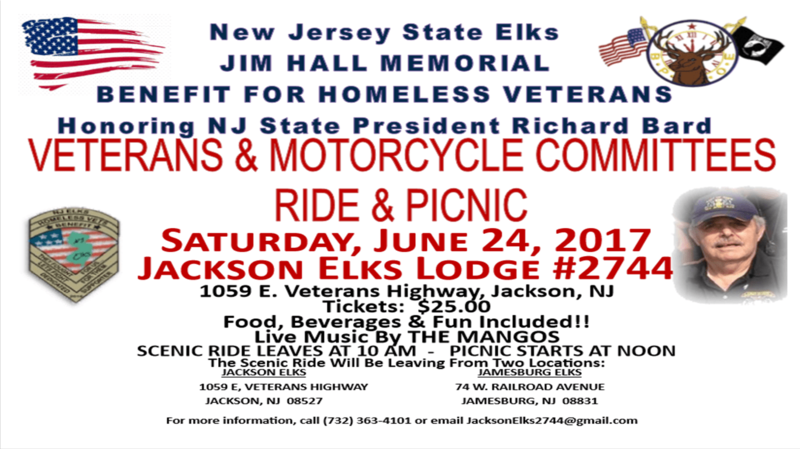 For more information, call 732-969-4101 or email JacksonElks2744@gmail.com.